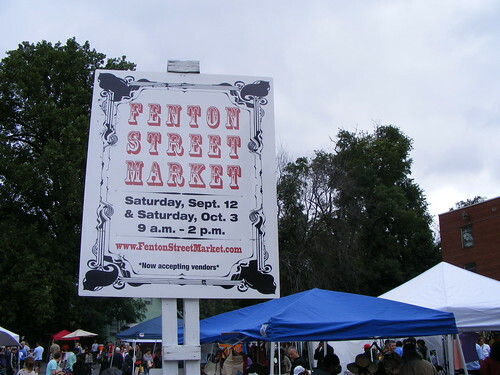 After two successful Saturdays last fall, the Fenton Street Market returns in 2010 for EVERY Saturday from April 17 through the end of October. Last year, creator/magazine writer/nearby resident Hannah McCann noticed an empty parking lot at Fenton Street and Silver Spring Avenue and contacted property owner Ulysses Glee, who offered to let her use it for a weekly flea market drawing dozens of local vendors and hundreds of visitors. and has a new partnership with the Latino Economic Development Corporation, giving them more support for the local businesses who will appear there.
. . . Fenton Street Market promises fun and excitement from week to week! There will be 60+ vendors selling antiques, imported goods, crafts, art, and food, plus live music and various interactive programs to entertain and engage shoppers as they stroll the aisles! Everyone with a service or product of value to the community is encouraged to apply to participate in the market. All applications will be considered, with an emphasis on quality and variety of product to keep the market fresh. Applications are being accepted on a rolling basis through the season's end in October, and are available online at www.fentonstreetmarket.com. New developments since last fall's test dates bring solid footing to the 2010 season. The market is being run as a partnership between McCann and the Latino Economic Development Corporation (LEDC), an area nonprofit supporting small and independent business. And local dynamo Debbie Lee, founder of Rock-n-Romp and Handmade Mart, has signed on as the Fenton Street Market's manager. Fenton Street Market is held at the corner of Fenton Street and Silver Spring Avenue in Downtown Silver Spring. The Silver Spring Metro is a short walk away, and there is free parking in the public lots across Fenton Street. A number of wonderful independent stores and restaurants are in the immediate area for shoppers to visit and support while they're in the neighborhood, and Fresh Farm market runs a weekly Saturday farm market 4 blocks away . . .
For more information contact Debbie Lee at debbie@fentonstreetmarket.com.